The new discovery is presented in the 2013 edition of the journal Archäologische Ausgrabungen in Baden-Württemberg. Vogelherd Cave is located in the Lone Valley of southwestern Germany and is by far the richest of the four caves in the region that have produced examples of the earliest figurative art, dating as far back as 40,000 years ago. Overall, Vogelherd Cave has yielded more than two dozen figurines and fragments of figurines. 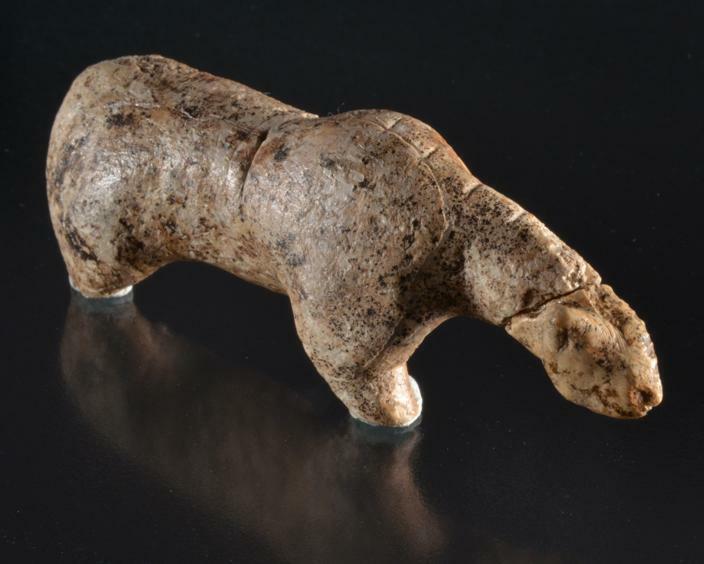 While the work of fitting together thousands of small fragments of mammoth ivory from Vogelherd is just beginning, the remarkable lion figurine, now with its head, forms an important part of the display of the earliest art at the Museum of the University of Tübingen (MUT) in Hohentübingen Castle. Professor Nicholas Conard and his excavation assistant Mohsen Zeidi today presented the new discovery and discussed its scientific importance, after which the find rejoined the permanent exhibit at MUT.